If you are a smart homeowner, you probably already know why having durable gutters is important for the value of your home. These gutters are used to redirect the rainwater away from the property. This make your home in shape and looking good. This is the reason why proper gutter maintenance is important to make sure that your house is away from any damage caused by rainwater. Now that fall is coming, it is especially important to make sure that our gutters at home are properly maintained and cleaned regularly. Not cleaning your gutters can result to falling gutters, flooding and even a cracked foundation. Here are the things that you should do to prepare yourself (and your gutter) as fall comes in. Scoop out any leaves that have fallen into the gutters. Get a ladder and climb up to get a good look at the gutters and carefully scoop those leaves out. These fallen leaves will cause a lot of problems if not taken out of there. Pay attention to the downspout. If the gutter is free from leaves, it could be because they have been washed into the downspout. This part is the long tube that takes the water down from the top of the house down to the ground. Leaves and other debris can clog the downspout and the water will not get drained properly. Overtime, the rivets can get loosened and will eventually drop completely. Make sure that all rivets are tightly secured on all parts of the gutter. Do not worry for loose rivets. Just get a rivet gun and secure them anew. Safety first. Cleaning the gutters is an easy task. However, you should always be careful in doing the chore because accidents can happen. Use a sturdy ladder when climbing up. Plant it firmly on the ground. Make sure it’s not shaking when you climb on it. Do not carry sharp tools when climbing. If you really need to carry one, use a bucket or a plastic bag and hook it with an S-hook to the top. Use safety goggles to protect your eyes from the dust and debris. If it is possible, do not work near power lines. Use gloves when scooping out leaves and debris from the gutter. Carry an empty bucket with you to the top of the ladder. Use this bucket to dump the leaves, twigs and other debris on your gutter. Use a hose with spray nozzle. This particular equipment should be used to clean out small debris and dirt. Position yourself at the opposite end of the downspout, and spray until the small debris get drained down the spout at the other end. 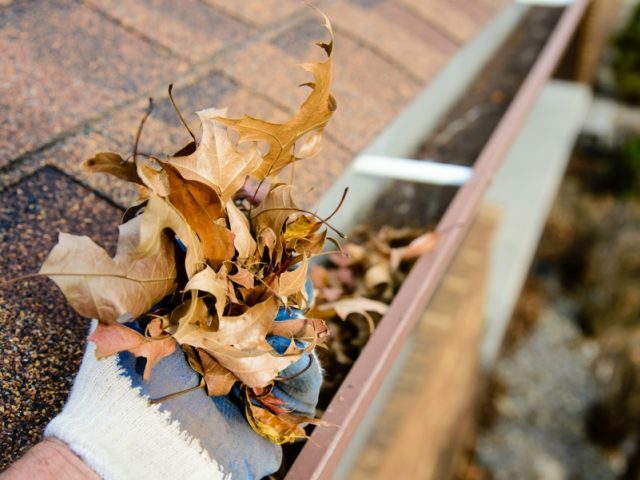 Gutters can be especially dirty during fall as all the leaves fall down from the trees. This is why it is important to pay much more attention to the gutters at this time of the year. Gutters that are full of debris can pull away from the house and fall. If water cannot properly flow down the spout, it can drain towards your basement and start a flood there. If rain gutters are clogged, water which spilled over the sides can cause cracks on your house’s foundation. Water that spilled over the sides can cause discoloration on your house’s exteriors. For help with gutter repair and installation, contact an experienced roofing specialist in your neighborhood.